Do you wish your Variable Frequency Drives and PLC’s could talk? ADSConnect links your equipment with experts that speak its language. Live Remote Support for your critical variable frequency drives and programmable logic controls. Maximizing profits is directly linked to minimizing downtime for all businesses with production equipment. With shrinking maintenance budgets and staffing levels, many businesses struggle to maintain in house, high level expertise with Variable Frequency Drives (VFDs) and other critical automation systems. With ADSConnect, your VFDs and automation equipment are always linked with our staff of expert technicians who are available 24/7/365. Every subscription includes continuous fault notification, logging and diagnosis, as well as a block of time for live troubleshooting, extended diagnostics, or remote programming. ADSConnect brings decades of VFD and Automation experience directly to your production floor, no travel required. ADSConnect is a service subscription that communicates with your critical plant equipment, providing full-time fault notification, with trip response analysis performed by one of our automation experts. Our secure network equipment, provided and maintained at no cost during your subscription, creates a secure point-to-point connection between your plant equipment and our response center in Omaha, NE. In addition to trip response and next-step recommendations, we are also able to provide advanced troubleshooting assistance, run diagnostic trending of operating parameters and provide remote programming when changes are needed. Time allowance for non-fault related event or operation troubleshooting, extended duration diagnostics and remote programming changes. Fault event email notification of every fault within 1 hour that includes recommended response action and next steps. Remote Backup of operational setup data and equipment parameters. Remote Connection hardware and data plan (if cellular) provided during subscription, with no cost Next Day Air replacement in the event of a device malfunction. Priority Access to ADSConnect Technicians for emergency and non-emergency response. Permanent connections for critical equipment as well as RescueKit portable device available for providing support for groups of equipment. Can be configured to work with Ethernet enabled devices, serial devices and even some USB connected devices. Equipment can reach the outside world via hardwired, WIFI or Cellular connections to match your plant infrastructure. ADSConnect hardware provides an on-demand encrypted VPN connection to your equipment with built-in firewall at the device level. ADSConnect is technical support for the 21st century. With the Internet of Things (IoT) and rapid adoption of having devices networked and “smart”, we see a need beyond just a physical network connection. Having a factory full of “smart” devices still has limitations tied to each facilities’ technical capabilities, staffing levels, and experience with critical plant equipment. With an ADSConnect subscription, your equipment is linked with an experienced team of engineering technicians that have decades of practical experience. With many telephone technical support requests, the majority of the time spent, is just in trying to become familiar with how a specific piece of equipment is used, and getting an understanding of the desired operation. 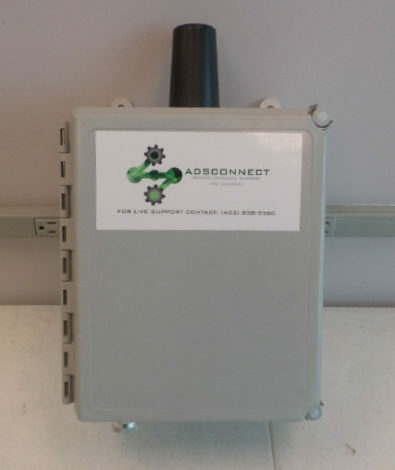 ADSConnect allows our technicians to remotely access the device, gather the parameters, and quickly provide solutions. Many machine OEM’s will offer some form of remote support specifically for their product, but customers with critical equipment without OEM support are left without access to this powerful tool. ADSConnect brings the same benefits of OEM remote support to all of your critical VFD applications, as well as many types of PLC equipment and other serial or Ethernet capable devices. ADSConnect is a service of Automated Drive Systems, based in Omaha, Nebraska. Our team consists of dedicated professionals who have a passion for VFDs and Automation. Using our skills and passion, we are able to resolve issues quickly and you are able to leverage our decades-worth of experience with nearly every type of practical application. Connect your critical plant equipment and see how quickly you can reap the financial rewards of on-demand support with ADSConnect. With a dedicated team of Variable Frequency Drive and Automation experts, we are able to use our experience to quickly solve your most challenging problems. Brenden has 23 years of experience, having started with variable frequency drives at 10 years old, flashing EEPROM chips for his father’s drives business. Over his career he has dedicated himself to being an expert in VFDs and industrial automation. His experience is highly regarded by local companies as well as nationally as a consultant on low and medium voltage VFDs and complete automation systems. Take advantage of our remote subscription and get 24/7 support. Contact us for more information.